Bridal sessions are typically done after the wedding when there is less stress for the couple. Typically during the wedding, we only have a short time between the ceremony and the reception so we can't really go too far to do creative shoot. After the wedding, we can go to more exotic and unique location to do the session. Most people usually do trash the dress after their wedding but we like our couple shoot to be more stylized and creative than just jumping into the water or mud. We had the privilege to capture Laura and Carlos's big day a while back. Now with the wedding day is behind and everything settle down, we meet again to do a bridal session in San Diego for Laura and Carlos. Regardless whether it's an engagement or bridal session, we like to give the couple a varieties of settings when we shoot so after we finished retouching all the best images, the couple will have more option to choose from. Couple weeks ago, one of my good friend, makeup artist and model was engaged. I had the honor and privilege to photographed her engagement session with her fiancee, Tuan in the beautiful sunny San Diego. We were very fortunate because that day the weather was perfect. We have sunny day through out and even an amazing sunset toward the end of our shoot. Just found a shoot that I did for Brian and Jaime in my hard drive. It was a stylized and concept shoot we did in downtown San Diego. Wanted Brian to have that Bond formal kind of look with our pretty Jaime. I love to add that edgy and fashion look to the concept so we did a little bit of that. It was a fun and amazing shoot. After we did a few individual look for Brian and Jaime then I put both of them together for a couple look. My favorite shot was this last one we did before the sun went down. I had a wonderful opportunity to work with Kendra on a shoot during my visit to St. Louis, MO couple weeks ago. We did a few looks with Kendra. Here is the evening last look that we did at the St. Louis Union Station (1820 Market St, St. Louis, MO 63103). Make up and hair was done by our talented artist Karimu Lindsey (KarimuLindseyMakeup.com). When I'm not photographing for my wedding or portrait client, I love to work on my photography personal projects. These can range from photographing landscapes to fashion and glamour. One of my favorite photography personal projects is creative headshots. Unlike the traditional headshot where you are constraint with rules and the realm of reality. Creative headshot is where you can really let your imagination run wild. It is whatever you image it to be. The concept can be fantasy like. In order to have a successful creative headshot, I like to work with great makeup artist, hair stylist, and models. You come up with an idea then share it with your creative team so you can get input. You then plan everything that go into the shoot and finally execute the shoot. Below you'll find some of the images that I had shot in the past. The makeup and hair for most of these shots are done by my friend and talented makeup artist, Amy Huynh. You can check out more of her work on her website Amy Huynh. Going behind the scene with Amy putting on final makeup and hair work before we head out to the shoot. It is finally here. I can't believe I had just experienced Katie and Ky's wedding a second time as I going through their wedding day images. I remember all the planning and talking of their engagement and bridal shoot in the East coast then the shoot...now we have come to not the End but a Beginning of another chapter of their life. It was truly an awesome experience for me and Nelly to document Katie and Ky's special day. We tried to give credit to all the talents that had help make that day possible at the end of this post. If we forget any one then please email us and we'll add you in. Please enjoy Katie and Ky's wedding images. We started with the Vietnamese traditional ceremony at both family. After the traditional ceremony, we continue to the Old Ranch Country Club for the American wedding ceremony. A portrait shoot that I did with Jackquelyn a few months ago in San Diego. We went for an urban and rustic look. One of the area that we shot I had happened to tumble on the week prior to the shoot. Black and white photographs have coming back over the years. People starting to appreciate and understand its essence. I love black and white images as well but I don't use it for the entire shoot. I believe some images need to be show case in a black and white feel while other should remaining in color. Here are some the factors that I use to determine if an image would go black and white. Documentary - when I do behind the scene of the shoot or documented an event then I feel the black and white photos really allow the user to focusing on the details of the subject. Sometime, it helps reduced many distracting colors in the background as well. Details - Showing detail from an event or wedding. Black and white photos really made these object pop. Emotions - I love showing the emotion of my couple and my subject in the photograph. When I stripped away the color of the image, the viewer has no choice but to grasp the feeling and mood that each subject in the photograph displayed. Classic Beauty - when I capture a moment or an angle that show case the beauty of my female subject then I think one of that image should be black and white. It's just so timeless and amazing. Even many years from now when all the color tone and trend changes, you can still appreciate that black and white image. You can't really tell when it's taken and that made it timeless and fine art. Two days ago, I had the opportunity to captured Katie and Ky's special day. I remember not too long ago all of us was in the East Coast shooting for their engagement and bridal. We had a great time enjoyed the Fall color in a different part of the country and the journey to each places that we shot at. The wedding on Saturday was amazing. We started the day with the traditional Vietnamese wedding ceremony then continue with the American wedding ceremony at the Old Ranch Country Club in Orange County. We will have the wedding coverage for you guy in the next post. Here is a quick video slideshow that I put together for Katie and Ky that played during their wedding reception. It started with some of their baby photos then a few photos when they were first dating. The last part of the slideshow are images from our shoot in the East Coast. When the video finished rendering in my computer, I watched it for the first time and it touched me to see how far Katie and Ky had come in their journey. I feel fortunate to had been a small part of their journey. It was a lot of good memories and joy. Thank you for letting me and Nelly capturing your big day. We know you had many other choices when it comes to photography and we really appreciated that you guy had trusted us to deliver. We started our bridal shoot in New Hampshire then finished in Maine. Every season offers a unique photo opportunity. Once that season passed, it's very difficult to recreate the same scene and feel. That why we encourage our client to take advantage of each coming season and plan out their photoshoot accordingly. Last post, we cover the engagement shoot for Katie and Rowland. 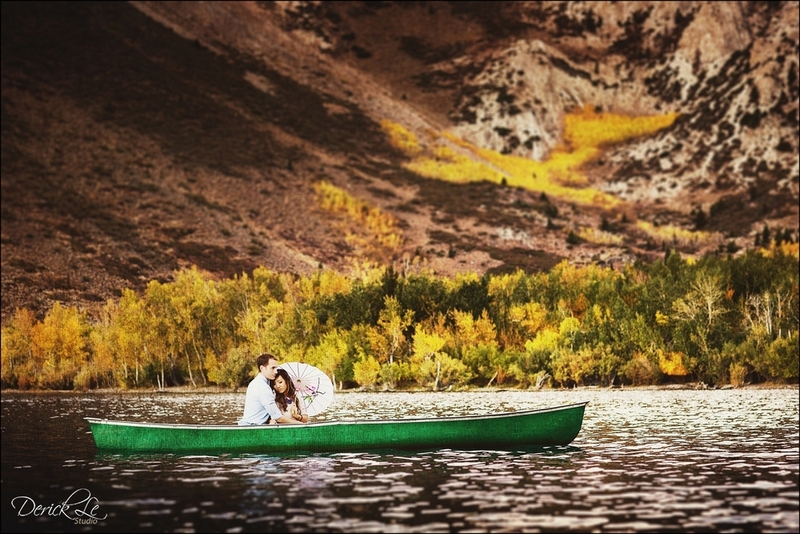 In this post, we will be reviewing another amazing couple that we had the privilege of captured their engagement image in Eastern Sierra. Mimi and Nick living in Southern California so they are surrounded by many beaches. All of them are pretty to photograph. But Mimi wanted something more than just the beach scene which we feel the same is too over done. So it was a perfect choice when we mentioned with Mimi about the idea of doing a Fall shoot in Eastern Sierra / Mammoth. Last year, we had the opportunity to photograph for Truong & Michelle at this wonderful location. Everyone in the group had a blast. It was exhausting but fun and exciting. This year, we wanted to change a little bit since we had photographed at this location the previous year. As you see from the photos from the Convict lake. We had Mimi & Nick paddle in their canoe out into the lake and I followed them on a small kayak to document the journey. Last year, we were only capture the image from the dock because we got there a little bit late and the rental place already closed. Here is a slideshow video documented some of the area that we photographed in the Eastern Sierra. We hope you enjoy. Wow, can you believe we just stepping into another new year? With a great outlook for this coming 2015, we wish you guys a year fill with much love and happiness. As always, we hope to be your number one source for Wedding and Portrait photography. Just a month or so ago, we had great opportunity to work with a wonderful couple during their trip to the East Coast from San Diego, CA. We photographed Katie and Rowland for their engagement and stylize bridal photoshoot. What an amazing time and awesome location we shot at. Here are some of our favorite shots from the shoot. Hope you guys enjoy them as much as we do. The engagement session started in Boston. We went around a few areas in downtown to shoot. Brattle book store was pretty cool. Beside the main store, they also got a small portion of books display in the alley area. When I saw this book store online a few weeks prior to the shoot, I knew I wanted to photograph my couple there. We continue going further down and we encounter many other equally good scenic to shoot. We love the architecture in the East coast. There just so much history here. The beauty is every where you go. From one brick building to the alley in a small street make a great photo. Having a fun and willingness to explore couple also help a lot. We encounter a few set back. One of which is traffic. Boston is not a very traffic friendly. It was very crowded. We have to carpool to make sure we don't get lost and even then, the traffic still took a lot of our time. Thank you to Rowland, our groom who did the driving. He did a fantastic job. A special thanks go out to my good friend Greg. Who had help me through out the shoot. Couldn't have done it without you Greg. When shooting in a new area that is hundreds of miles away from where you live, there is always a little bit of nervousness and having a friend with you always help. We finished our Day 1 engagement shoot in Boston at the Church of Christ, Scientist. This place is so beautiful at night. I don't think anyone can take a bad photo here. It is just that amazing. Stay tune for our next post that will cover the Day 2 shoot with Katie and Rowland. We'll have a Bonus slideshow video for you guys ;)...Have a wonderful weekend everyone! !